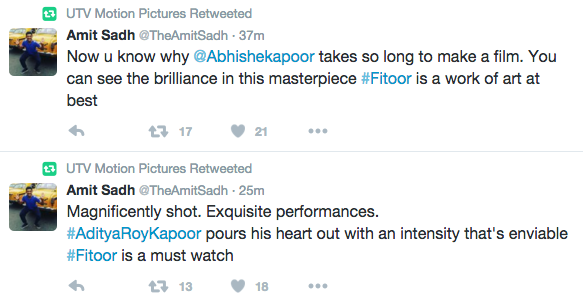 Home BOLLYWOOD Fitoor Review: Bollywood Tweet On Katrina Kaif-Aditya Roy Kapur Starrer! [tps_footer]This week’s big release Fitoor starring Aditya Roy Kapur and Katrina Kaif has released today on February 12. After his film Kai Po Che!, director Abhishek Kapoor has come up with another masterpiece, beautifully shot in Kashmir. Aditya Roy Kapur as Noor and Katrina as Firdaus, the two have magically showcased the beautiful love story. Based on Charles Dickens’ novel Great Expectations, the film holds you back till the last scene of the film. After Haider, actress Tabu has once again nailed it with her character Begum. The film portrays Noor’s passionate love for Firdaus, who bears all the hardship, emotions to achieve her, but succeeds at the end. 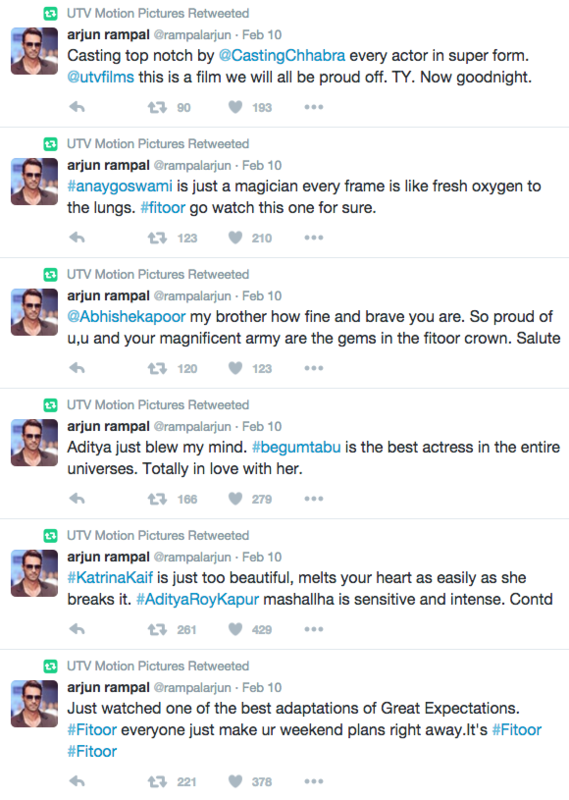 The film has released today and our Bollywood stars who have already watched the film took to twitter to put their reviews. Bollywood stars Sidharth Malhotra, Karan Johar, Arjun Rampal, Bhumi Pednekar and many other stars shared their views on the film. Next articlePhotos: Katrina Kaif, Sidharth Malhotra, Aditya Roy Kapur And Others At Fitoor Screening!